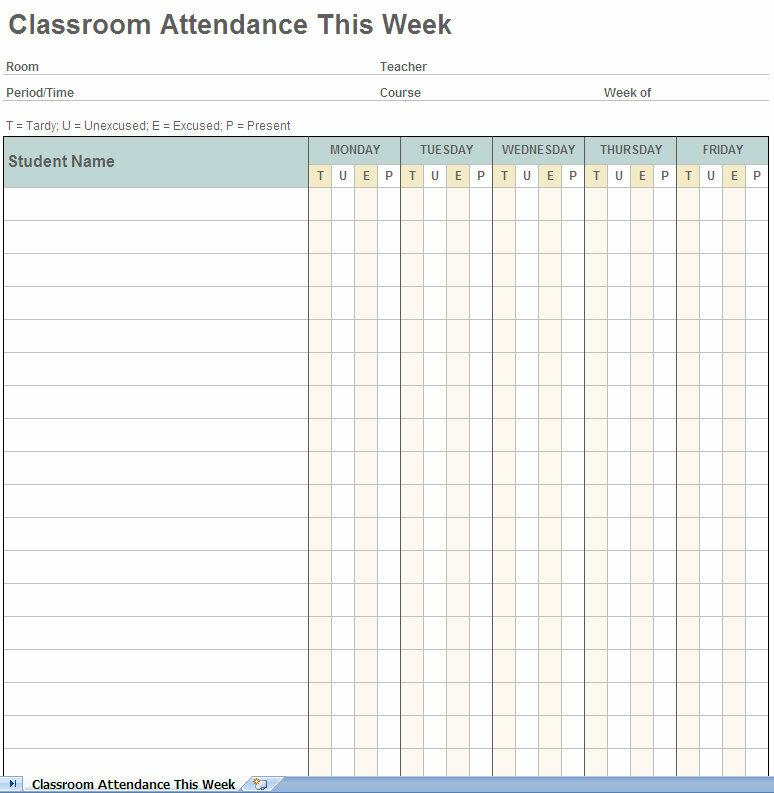 The Weekly Student Attendance Tracking System simplifies the task of taking attendance. This template has the potential to make any teacher’s job easier. It consists of a row for each student, in which the days of the week are listed with an option for tardy, excused, unexcused, and present in each day column. There is also room on the template to record information such as teacher, period, room number, course, and week. 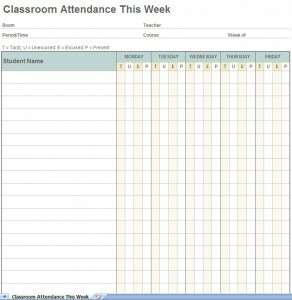 The Weekly Student Attendance Tracking System is also simple to customize for your unique recording needs. An added bonus of downloading this useful template is that it is completely free and is usable by any computer with Excel. Get it right here for free! Keep track of your classroom individuals quickly with this document. It can be used to note tardiness, excused, unexcused and present attendance with the click of a button. You can also add extra columns to customize your attendance taking experience. This is definitely the speediest and simplest method of attendance taking. To take full advantage of this free offer, all you have to do is download it right here! Then all you have to do is open the document using Excel to personalize the Weekly Student Attendance Tracking System and record attendance. Using this document is extremely straightforward as long as you can navigate a basic Excel document. If you prefer to take attendance by hand, this document could be printed out and used the old fashioned way, but it’s also very simple to take attendance on the computer. An especially easy way to record absenteeism and such is to just highlight the box you wish to fill in and click the fill color button (the one that looks like a pouring paint can). Make sure to set the fill color to something other than white. Make sure to save often to avoid gaps in your attendance archives. Lastly, enjoy having all of your attendance records available at your fingertips. The Weekly Student Attendance Tracking System Template is just one of the many helpful tools available for teachers and educators available at MyExcelTemplates.com. you are providing very good information…. thank you.